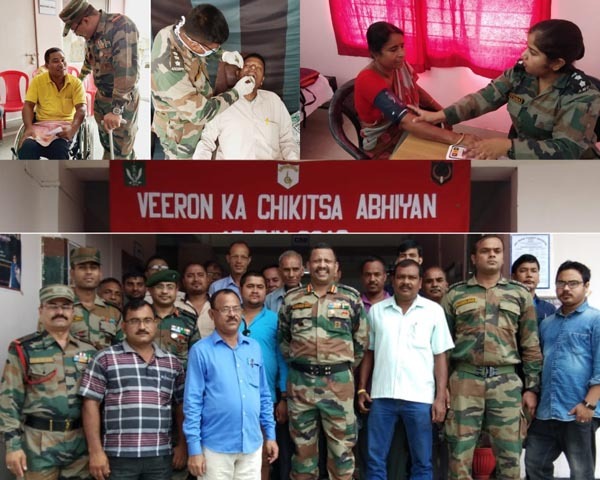 Chindits Battalion of the Red Horns Division conducted a medical camp for the Ex-Servicemen in Nalbari and Kamrup districts of Assam as part of ‘Veeron Ka Chikitsa Abhiyaan’ on Friday. The camp was conducted as part of celebrations for the ‘Year of the Disabled Soldier’ as a mark of gratitude to those who have scarified their lives and limbs in service to the nation. As part of the arrangements, a comprehensive medical camp was setup to include specialist medical staff and dental health professionals from Field Hospital, Changsari to provide extensive care to Ex-Servicemen, disabled soldiers, Veer Naris, widows and their dependents. A team from the state Revised National Tuberculosis Control Program Mission was also included to provide free consultation, checkups and guidance to the veterans and their families to combat the scourge of tuberculosis. Additionally, personnel from ECHS established a cell to redress grievances and provide assistance to those veterans who had yet to sign up for the facility. Other amenities included were counselling from the Army Placement Node to assist the Veterans in seeking employment in the civil sector. The event was attended by 176 Ex-Servicemen and families including 37 ladies. It was a resounding success as evidenced by the turnout and the appreciation from the veterans and their families.